A few weeks ago I had the honour of being part of the Indiesew Spring Collection Blog Tour. You may recall that I really wanted to make all five patterns and that I promised you a second Indiesew Blog Tour post with the two missing patterns – the Birkin Flares by Lauren from Baste + Gather and the Lou Box Top by Beth from Sew DIY. So when I saw that Annika from the German blog Näh-Connection translated the Birkin Flares pattern into German and needed a few people sewing examples of the Birkin Flares, I knew I had to join. Sometimes a deadline is all you need to get going! And I already had the pattern and even all the supplies lying at home, so I just needed to get it done. I had some mystery denim fabric with a little bit of stretch, bought at a local store. I had no idea how much lycra it contained or how stretchy the fabric was supposed to feel, but I just went for it and decided to make a size 24, cutting the waistband at a size 25. Lauren’s instructions are very clear and the sew-along on her blog is of great help, too. Whenever I didn’t understand the pattern instructions I just looked at the sew-along and everything made sense. Or the other way around – whenever the sew-along confused me, the instructions saved me. Perfect combination! I sewed part of my Birkins at a local sewing weekend I was attending and the owner of the local shop “Symaskinbutikken” let me try a Janome Skyline s7 while being there. I had had my eyes on the Skyline s7 for months and being able to try it for that long while making a pair of jeans was perfect. As soon as I switched to the Janome, my topstitching was so even! The sewing machine store is owned by a really kind and helpful man named Ståle and when I told him that I wanted to buy the machine, he just let me keep it, saying: “I figure you are going to come by the store on Monday to set up the contract?” Of course I am, but I still found it pretty amazing, since we’re far from talking about a sewing machine from Target. I made sure not to hurry and to sew everything exactly as it’s supposed to be (helloooo seam ripper! ), so sewing these jeans took me actually a long time. And after being so careful I managed to pull off the zipper pull when trying on the jeans! I hadn’t realized how close to the zipper teeth I had to sew to keep the zipper pull from falling off… The thought of unpicking everything nearly made me cry, so with good help of my hubby I managed to put the zipper pull back on, resulting in a little bulk at the end of the zipper. But it’s really not visible from the outside and isn’t uncomfortable either, so I can live with it. When trying on the Birkin Flares they were so tight at the hips that I couldn’t close them. Luckily the pattern includes a 5/8″/1,5 cm seam allowance, so adjusting them wasn’t a problem at all. But I think I might have stretched the waist band a little too much, not knowing how long it was supposed to be after adjusting the width of the pants. Because after attaching it they were really tight again! I can close them and the fabric stretched out a little, so it’s fine – but next time I really should use a stretchier fabric or size up. And I might need to add 1/2″ to the crotch, too, since the Birkin Flares feel especially tight there, altough that’s an issue that might resolve itself when sizing up. I was running really late when finishing my Birkins, but I was determined to make a Lou Box Top, too, before the photo shoot. But I just. can’t. keep. it. simple…. Instead of choosing an easy fabric and giving a damn about the inside of the garment, I had to choose a super soft and a bit heavy linen-rayon fabric from Miss Matatabi – it has the perfect drape for this pattern! And I had to cut the back separately, since I just had one yard of fabric. And I had to try the zipper hack. And I had to use French seams for the whole top. I really can make things complicated for myself from time to time! And when I was finally ready to take pictures it was snowing so much that it was hard to get a few decent photos outside. Other than that I love love love my new Lou Box Top, especially together with the Birkins! I like the shape and the loose fit, it’s super comfortable. I chose to make the scoop neckline and the dip hem and these lines (and the fabric!) really compliment the 70s vibe of my Birkin Flares. Beth’s instructions and her sew-along are easy to follow and the top is so versatile! It can be sewn in wovens or knits, with different necklines, closures and lengths. You can buy both patterns over at Indiesew, seperately or as a part of the Spring Collection bundle. And don’t forget to head over to Näh-Connection if you’re interested in the German version and lots of Birkin Flare inspiration! These are beautiful! They turned out so well. And they don’t look tight at all. Good job! Thank you so much! They look good, but they can be a little uncomfortable to wear… Hopefully the denim has bad recovery, in that case they might fit perfectly in a few weeks! ? As mentioned already at Insta: These Birkin Flares are awesome! And also the Pictures – wonderful! Thank you so much! 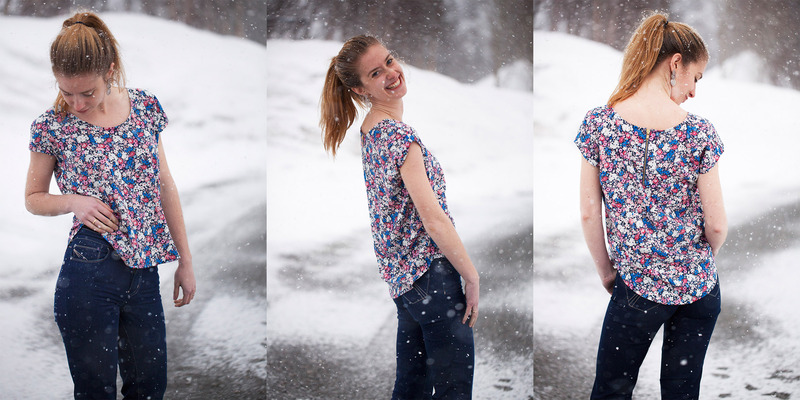 You can’t see the jeans that good because of all the snow, but at least it makes for a lovely photo shoot feature ? I love this outfit so much! The top is perfect and the jeans look amazing on you! Jeans are supposed to be really tight anyway, right? 😉 You’re a trooper for taking pictures in the snow!! Thank you, Emi! I have to admit that I really really like the outfit, too. 😉 I really need more handmade jeans, the chances of wearing nothing but me-made are so much higher with a couple of those in my closet!